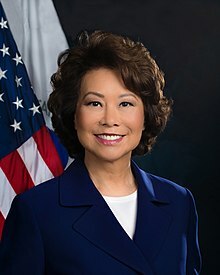 Elaine Lan Chao (Chinese: 趙小蘭; pinyin: Zhào Xiǎolán; born March 26, 1953) is the current United States Secretary of Transportation. A member of the Republican Party, Chao was previously Secretary of Labor under President George W. Bush from 2001 to 2009. Born in Taipei to Chinese parents who had left mainland China following the Chinese Civil War, Chao immigrated to the United States at age 8. Her father founded the Foremost Group, which eventually became a major shipping corporation. Chao was raised on Long Island, New York and subsequently attended Mount Holyoke College and Harvard Business School. She worked for a number of financial institutions before being appointed to several senior positions in the Department of Transportation under Presidents Ronald Reagan and George H. W. Bush, including Deputy Secretary. She next served as Director of the Peace Corps. Chao was president of the United Way of America from 1992 to 1996. While not in government, Chao has served on several boards of directors and worked for The Heritage Foundation and the Hudson Institute, two conservative think-tanks. Chao served as Secretary of Labor for the duration of George W. Bush's presidency and presently serves as Secretary of Transportation under President Donald Trump. Chao was the first Asian American woman and the first Chinese American in U.S. history to be appointed to a President's Cabinet. Chao married Majority Leader Mitch McConnell in 1993. Elaine Chao immigrated to the United States when she was eight years old. The eldest of six daughters, Chao was born in Taipei, Taiwan, to Ruth Mulan Chu Chao, a historian, and James S.C. Chao, who began his career as a merchant mariner and in 1964 founded a shipping company in New York City. The company, Foremost Maritime Corporation, developed into the Foremost Group; as of 2013, James S.C. Chao continued to serve as its Chairman, later succeeded by Elaine's sister Angela. James first met Ruth when she and her family relocated to Shanghai during World War II. In 1949, James and Ruth relocated separately to Taiwan at the culmination of the Chinese Civil War. They married in 1950. In 1961, Elaine came to the United States on a 37-day freight ship journey along with her mother and two younger sisters. Her father had arrived in New York three years earlier after receiving a scholarship. Chao attended Tsai Hsing Elementary School in Taipei for kindergarten and first grade, and subsequently attended Syosset High School in Syosset, New York, on Long Island. She was naturalized as a U.S. citizen at the age of 19. Chao received a Bachelor of Arts degree in Economics from Mount Holyoke College in South Hadley, Massachusetts, in 1975. In the second semester of her junior year, she studied money and banking at Dartmouth College. She received a MBA degree from Harvard Business School in 1979. Chao has received 37 honorary doctorates, including an honorary Doctor of Humane Letters degree from Georgetown University in 2015. Before entering public service, Chao was Vice President for syndications at Bank of America Capital Markets Group in San Francisco, California, and an International Banker at Citicorp in New York for four years. She was granted a White House Fellowship in 1983 during the Reagan Administration. In 1986, Chao became Deputy Administrator of the Maritime Administration in the U.S. Department of Transportation. From 1988 to 1989, she served as Chairwoman of the Federal Maritime Commission. In 1989, President George H. W. Bush nominated Chao to be Deputy Secretary of Transportation, serving from 1989 to 1991. From 1991 to 1992, she was the Director of the Peace Corps. She was the first Asian Pacific American to serve in any of these positions. She expanded the Peace Corps' presence in Eastern Europe and Central Asia by establishing the first Peace Corps programs in Poland, Latvia, Lithuania, Estonia, and the newly independent states of the former Soviet Union. Following her service in President George H.W. Bush's administration, Chao worked for four years as President and CEO of United Way of America. She is credited with returning credibility and public trust to the organization after a financial mismanagement scandal involving former president William Aramony. From 1996 until her appointment as Secretary of Labor, Chao was a Distinguished Fellow with The Heritage Foundation, a conservative think tank in Washington, D.C. She was also a board member of the Independent Women's Forum. She returned to the Heritage Foundation after leaving the government in January 2009. Portrait of Elaine Chao by Chen Yanning in the Great Hall of the U.S. Department of Labor's Frances Perkins Building. It features the American flag, the Kentucky state flag, the U.S. Capitol, and photos of her husband, Mitch McConnell, and her parents, James and Ruth Chao. The Washington Post wrote towards the end of Chao's tenure as Labor Secretary that the Labor Department under her was "widely criticized for walking away from its regulatory function across a range of issues, including wage and hour law and workplace safety." In 2002, a major West Coast ports dispute costing the U.S. economy nearly $1 billion daily was resolved when the Bush administration obtained a national emergency injunction against both the employers and the union under the Taft–Hartley Act for the first time since 1971. 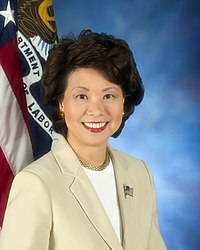 Led by Chao In 2003, for the first time in more than 40 years, the Department updated the labor union financial disclosure regulations under the Landrum–Griffin Act of 1959, which created more extensive disclosure requirements for union-sponsored pension plans and other trusts to prevent embezzlement or other financial mismanagement. In 2004, the Department issued revisions of the white-collar overtime regulations under the Fair Labor Standards Act. After analyzing 70,000 closed case files from 2005 to 2007, the Government Accountability Office reported that the Department's Wage and Hour Division (WHD) inadequately investigated complaints from low- and minimum-wage workers alleging that employers failed to pay the federal minimum wage, required overtime, and failed to issue a last paycheck. A 2008 Government Accountability Office report noted that the Labor Department gave Congress inaccurate numbers that understated the expense of contracting out its employees' work to private firms during Chao's tenure. A 2007 report by the department's inspector general found that mine safety regulators did not conduct federally required inspections at more than 14% of the country's 731 underground coal mines, and that the number of worker deaths in mining accidents more than doubled to 47. OSHA statistics for 2007 and 2008 revealed that overall workplace fatality rates and workplace injury and illness rates were "both at all-time lows". A 2009 internal audit appraising an Occupational Safety and Health Administration (OSHA) initiative focusing on problematic workplaces, however, stated that employees had failed to gather needed data, conducted uneven inspections and enforcement, and failed to discern repeat fatalities because records misspelled the companies' names or failed to notice when two subsidiaries with the same owner were involved. In 2009 Chao resumed her previous role as a Distinguished Fellow at The Heritage Foundation, and she contributed to Fox News and other media outlets. She also served as a director on a number of corporate and non-profit boards, including the Institute of Politics at the Harvard Kennedy School of Government, Wells Fargo, New York–Presbyterian Hospital, News Corp, Dole Food Company, and Protective Life Corporation. According to financial disclosure forms, Chao was slated to receive between $1–5 million for compensation for her service on the board of Wells Fargo. In June 2011, she was awarded the Woodrow Wilson Award for Public Service. In January 2015 she resigned from the board of Bloomberg Philanthropies, which she had joined in 2012, because of its plans to significantly increase support for the Sierra Club's "Beyond Coal" initiative. In February 2017, it was reported by the Associated Press that Chao in addition to former Joint Chiefs of Staff General Hugh Shelton, Commandant of the U.S. Marine Corps General James T. Conway, President Obama's former National Security Advisor General James Jones, former CIA Directors Porter Goss and James R. Woolsey, former FBI Director Louis Free and former Governors Howard Dean of Vermont and Ed Rendell of Pennsylvania had addressed organizations linked to the People's Mujahedin of Iran (aka Mojahedin-e Khalq or MEK), a group exiled from Iran after actions in the 1970s against the Shah of Iran and the Ayatollah Khomeini. Chao was paid a total of $67,000 for the two speeches, which took place in 2015 and 2016. Chao served as a distinguished fellow at the Hudson Institute until she was sworn in as U.S. Secretary of Transportation on January 31, 2017. U.S. President-elect Donald Trump announced on November 29, 2016, that he would nominate Chao to be Secretary of Transportation. The U.S. Senate confirmed Chao on January 31, 2017 by a vote of 93–6, with her husband Senator McConnell abstaining. An October 2018 Politico analysis found that Chao had more than 290 hours of appointments which were labelled as "private" during working hours on working days for her 14 first months. The hours were equivalent to seven weeks of vacation. Former Department of Transportation officials described it as unusual. Current DoT officials stated the slots existed to help ensure Chao's security, by obscuring her actual activities. Some U.S. Senators called for the Federal Aviation Administration (FAA) to temporarily ground Boeing 737 MAX 8 until an investigation into the cause of the crash of Ethiopian Airlines Flight 302 is complete. Chao, who has the authority to suspend the 737 Max 8, said that "If the FAA identifies an issue that affects safety, the department will take immediate and appropriate action." In 1993, Chao married Mitch McConnell, the senior U.S. Senator from Kentucky and the eventual Senate Majority Leader. They were introduced by Stuart Bloch, an early friend of McConnell's, and his wife Julia Chang Bloch, a Chinese American and a future U.S. Ambassador to Nepal, the first Asian American to serve as US Ambassador, who mentored Chao. Bloch described Chao as a "tiger wife", a reference to Amy Chua's 2011 book about her disciplinarian parenting style. The University of Louisville's Ekstrom Library opened the "McConnell-Chao Archives" in November 2009. It is a major component of the university's McConnell Center. In an interview with CNN, Chao said she sometimes regrets not having children, and she counseled young women that there are trade-offs in life. In the two years leading up to the 2014 U.S. Senate elections, she "headlined fifty of her own events and attended hundreds more with and on behalf of" her husband and was seen as "a driving force of his reelection campaign" and eventual victory over Democratic candidate Alison Lundergan Grimes, who had portrayed McConnell as "anti-woman". After winning the election, McConnell said, "The biggest asset I have by far is the only Kentucky woman who served in a president's cabinet, my wife, Elaine Chao." She has been described by Jan Karzen, a longtime friend of McConnell's, as adding "a softer touch" to McConnell's style by speaking of him "in a feminine, wifely way". She has also been described as "the campaign hugger" and is also known for bipartisan socializing. For example, in 2014 she hosted a dinner with philanthropist Catherine B. Reynolds to welcome Penny Pritzker as Secretary of Commerce, where she spent the evening socializing with Valerie Jarrett, Obama's closest advisor. The New York Times has described her as "an unapologetically ambitious operator with an expansive network, a short fuse, and a seemingly inexhaustible drive to get to the top and stay there." Elaine Chao is the oldest of six sisters, the others being Jeannette, May, Christine, Grace, and Angela. In April 2008, Chao's father gave Chao and McConnell between $5 million and $25 million, which "boosted McConnell's personal worth from a minimum of $3 million in 2007 to more than $7 million" and "helped the McConnells after their stock portfolio dipped in the wake of the financial crisis that year." As Secretary of Transportation, Chao appeared in at least a dozen interviews with her father, a shipping magnate with extensive business interests in the United States and China. Ethics experts said that the appearances raised ethical concerns, as public officials are prohibited from using their office to profit others or themselves. In 2012, the Chao family donated $40 million to Harvard Business School for scholarships for students of Chinese heritage and the Ruth Mulan Chu Chao Center, an executive education building named for Chao's late mother. It is the first building named after a woman on the Harvard campus and the first building named after an American of Asian ancestry. Ruth Mulan Chu Chao returned to school at age 51 to earn a master's degree in Asian literature and history from St. John's University in the Queens borough of New York City. ^ a b c d Horowitz, Jason (May 13, 2014). "Girding for a Fight, McConnell Enlists His Wife". New York Times. ^ "James S. C. Chao". Horatio Alger Association of Distinguished Americans. Archived from the original on May 10, 2013. Retrieved March 3, 2013. ^ "Speaker". ANGELA CHAO. Retrieved February 20, 2019. ^ "Elaine L. Chao Biography". Encyclopedia of World Biography. Retrieved March 3, 2013. ^ "Dr. James S.C. Chao". The Foremost Foundation. Retrieved March 26, 2017. ^ Christopher Marquis (January 12, 2001). "Woman in the News; A Washington Veteran for Labor; a Tested Negotiator for Trade; Elaine Lan Chao". The New York Times. ^ "Biography". Elainechao.com. Retrieved July 23, 2017. ^ "Elaine L. Chao Official Biography". Retrieved May 3, 2014. ^ "Former Secretary of Labor Encourages Graduates to Create Value". Archived from the original on June 11, 2015. Retrieved May 16, 2015. ...Chao was awarded an honorary doctor of humane letters from Georgetown University. ^ a b "Elaine L. Chao". Bloomberg Business. Retrieved February 18, 2015. ^ "Appointment of the 1983 – 1984 White House Fellows". Reagan Library. Archived from the original on March 22, 2017. Retrieved March 21, 2017. ^ a b "Elaine L. Chao Biography". Bio. Retrieved September 9, 2014. ^ CNN, Phil Mattingly and David Wright. "Trump picks Elaine Chao for transportation secretary". CNN. Retrieved March 26, 2017. ^ Shillinger, Kurt (October 1, 1991). "Peace Corps Enters the '90s Invited into Eastern Europe". Christian Science Monitor. ISSN 0882-7729. Retrieved March 26, 2017. ^ "PEACE CORPS PLANS TO SEND VOLUNTEERS TO BALTICS IN 1992". DeseretNews.com. November 7, 1991. Retrieved March 26, 2017. ^ "Elaine Chao Leaves United Way". The Chronicle of Philanthropy. May 30, 1996. Retrieved March 26, 2017. ^ "History | United Way". secure.unitedway.org. Archived from the original on March 27, 2017. Retrieved March 26, 2017. ^ "Elaine L. Chao". Biography. Retrieved March 26, 2017. ^ Schreiber, Ronnee (2011). "Pro-Women, Pro-Palin, Antifeminist: Conservative Women and Conservative Movement Politics". In Aberbach, Joel D.; Peele, Gillian (eds.). Crisis of Conservatism? : The Republican Party, the Conservative Movement, and American Politics After Bush. Oxford: Oxford University Press. p. 135. ISBN 9780199764020. ^ a b Hoover, Amanda (November 29, 2016). "What you should know about Elaine Chao, Trump's pick for transportation". Christian Science Monitor. ISSN 0882-7729. Retrieved March 26, 2017. ^ Elaine Chao (December 11, 2008). "Portrait Unveiling Remarks". Elaine L. Chao. ^ "Chao becomes fifth-longest-serving Secretary of Labor". Peace Corps Online. Retrieved December 21, 2007. ^ "US Department of Labor History". Archived from the original on July 9, 2012. Retrieved September 16, 2009. ^ a b Michael A. Fletcher (December 1, 2008). "Labor Dept. Accused of Straying From Enforcement". The Washington Post. Retrieved February 4, 2012. ^ David E. Sanger; Steven Greenhouse (October 9, 2002). "President Invokes Taft-Hartley Act to Open 29 Ports". New York Times. ^ Horowitz, Carl (October 20, 2008). "Labor Department Issues Final Rule for Union Trusts". National Legal & Policy Center. Retrieved March 27, 2017. ^ Greenhouse, Steven (April 21, 2004). "Labor Dept. Revises Plans To Cut Overtime Eligibility". The New York Times. ISSN 0362-4331. Retrieved March 27, 2017. ^ "GAO Case Studies from Ongoing Work Show Examples in Which Wage and Hour Division Did Not Adequately Pursue Labor Violations – Statement of Gregory D. Kutz, Managing Director Forensic Audits and Special Investigations" (PDF). July 15, 2008. ^ Shields, Todd; Jacobs, Jennifer; Dlouhy, Jennifer (November 29, 2016). "Transport Pick Chao Gets Conservatives' Praise, Labor Criticism". Bloomberg Politics. Retrieved January 26, 2017. ^ Carol D. Leonnig (November 25, 2008). "GAO Report Says Labor Department Misled Congress on Cost of Outsourcing Jobs". The Washington Post. Retrieved February 4, 2012. ^ "Better Cost Assessments and Departmentwide Performance Tracking Are Needed to Effectively Manage Competitive Sourcing Program" (PDF). November 2008. Retrieved February 4, 2012. ^ "U.S. Labor Department's OSHA highlights another successful enforcement year in FY 2008" (PDF). Retrieved December 19, 2008. ^ "OSHA Injury & Illness Data FY2007". Retrieved December 19, 2008. ^ Smith, R. Jeffrey (April 2, 2009). "Initiative On Worker Safety Gets Poor Marks: IG's Report Links Weak Enforcement To Job Fatalities". The Washington Post. Retrieved February 4, 2012. ^ "Trump picks Elaine L. Chao for transportation secretary". Washington Post. Retrieved March 27, 2017. ^ "Elaine Chao: Director of the Day". Center for Economic and Policy Research. Archived from the original on July 19, 2014. Retrieved February 18, 2015. ^ "Elaine L. Chao, director since 2011". Wells Fargo. Archived from the original on March 10, 2015. Retrieved February 18, 2015. ^ "Dole | Company Info | Biography". Dole. Archived from the original on July 12, 2012. Retrieved February 4, 2012. ^ "Protective Life: Board of Directors". Protective Life. Retrieved February 4, 2012. ^ "Bush Cabinet Member Will Advise Gyro". Gyro. Retrieved February 4, 2012. ^ Rick Segal (October 27, 2011). "CMOs Explore Work-Life Balance and Brands". Forbes. Retrieved February 4, 2012. ^ Olen, Helaine (January 17, 2017). "Elaine Chao Will Have a Second Income Source When She's Transportation Secretary: Millions From Wells Fargo". Slate. Retrieved August 3, 2017. ^ "Louisville 2011 Woodrow Wilson Awards". Wilson Center. June 24, 2011. Archived from the original on July 12, 2012. Retrieved February 4, 2012. ^ "Bloomberg Family Foundation Announces Four New Board Members". Bloomberg Philanthropies. April 5, 2012. Archived from the original on February 18, 2015. ^ Youngman, Sam (January 21, 2015). "Elaine Chao resigns from Bloomberg board as it increases 'Beyond Coal' investments". Lexington Herald-Leader. ^ Moore, Mark (February 5, 2017). "Rudy Giuliani and Elaine Chao paid by 'cult-like' Iranian group to give speeches". New York Post. Retrieved February 7, 2017. ^ "Trump Cabinet pick was paid by 'cult-like' Iranian exile group that killed Americans". The Independent. February 5, 2017. Retrieved February 7, 2017. ^ Gambrell, Jon (February 5, 2017). "Trump Cabinet pick paid by 'cult-like' Iranian exile group". ap.org. Retrieved February 5, 2017. ^ CNN, Phil Mattingly and David Wright. "Trump picks Elaine Chao for transportation secretary". CNN. Retrieved November 29, 2016. ^ "US Senate Roll Call Vote PN35". United States Senate. January 31, 2017. Retrieved January 31, 2017. ^ "Where is Elaine Chao?". POLITICO. Retrieved October 12, 2018. ^ "U.S. Senate to hold crash hearing as lawmakers urge grounding Boeing 737 MAX 8". Reuters. March 12, 2019. ^ "Open house set Nov. 12 for new McConnell-Chao archive". University of Louisville Today. University of Louisville. November 11, 2009. ^ "Mission of the Archives". McConnell-Chao Archives and Civic Education Gallery. Retrieved February 18, 2015. ^ Bash, Dana. "Elaine Chao opens up about not having children". CNN.com. Retrieved July 23, 2017. ^ a b Jay Newton-Small (November 9, 2014). "Mitch McConnell's Secret Weapon: His Wife". Time Magazine. ^ Bailey, Phillip M. (August 4, 2014). "Democratic Strategist Under Fire for Criticizing Mitch McConnell's 'Asian' Wife". WKMS. ^ a b "Paid Notice: Deaths – Chao, Ruth Mulan Chu". New York Times. August 8, 2007. ^ Michel Martin (July 18, 2012). "For Elaine Chao, A Tough Voyage To U.S. Leadership". NPR. ^ Fang, Lee (October 30, 2014). "Mitch McConnell's Freighted Ties to a Shadowy Shipping Company". The Nation. ISSN 0027-8378. Retrieved February 7, 2018. ^ John Bresnahan; Manu Raju (June 12, 2009). "Members' fortunes see steep declines". Politico. ^ Fang, Lee (October 30, 2014). "Mitch McConnell's Freighted Ties to a Shadowy Shipping Company". The Nation. ^ a b "Did Elaine Chao's DOT interviews help her family's business?". POLITICO. Retrieved May 7, 2018. ^ John Lauerman (October 12, 2012). "Harvard Business School Gets $40 Million Gift From Chao Family". Bloomberg Business. ^ "Harvard Business School Building Boom Continues". Harvard Magazine. October 12, 2012. ^ "Chao Center – About Us – Harvard Business School". www.hbs.edu. Retrieved February 6, 2017. Wikimedia Commons has media related to Elaine Chao. This page was last edited on 11 April 2019, at 20:03 (UTC).